We have been pulling weeds in the garden this week. Last year we didn't plant anything in my little garden plot, and weeds grew up through the ground cover. They were taller than me! Monday, the dead ones were easily pulled out, but the live ones felt like I was trying to pull up trees by hand. My son even tried to help me chop them down, but I needed the roots out completely. Tuesday it rained hard. Our yard is now a muddy mess. In the garden, when I tried pulling weeds again Wednesday, all of them easily pulled out. I worked on my little plot over an hour, pulling the tall weeds and throwing them over the fence. 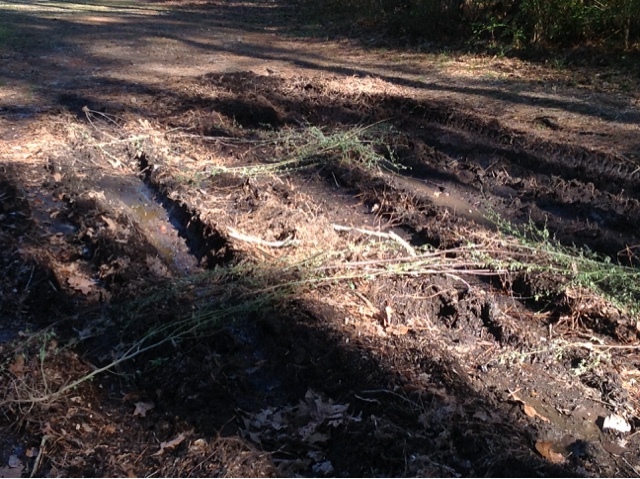 My son suggested (after getting the golf cart stuck in the mud) that the weeds could fill the holes in the ground. We carried piles of them to the deepest ruts, and something unwanted was turned into something with a purpose. Wishing you and your son some days with no rain and strength to carry on the good work in the garden! Thank you for the words of encouragement - the Scripture speaks truth and He does shine through in our weakness.